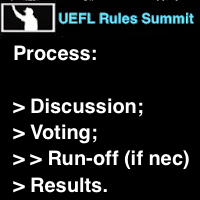 The following are results of the 2018 UEFL Rules Summit. Based on your votes this year, no rules will be changed for the 2019 Umpire Ejection Fantasy League season. Appeals Board re-election results are also posted. Items that passed (indicated in green highlight had there been any) would have become rules for the 2019 UEFL season. Text of items which did not pass (all of them) are indicated in red highlight. Successful Appeals Board re-elections are indicated in green. Prop 1-2: Addition of Drafted Crew Chief - 38.9% YES. > Would have added one crew chief to the draft. 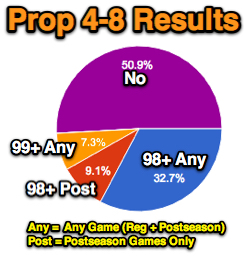 Prop 1-6: Addition of Drafted AAA Umpire - 49.1% YES. > Would have added one fill-in draft pick. Prop 3-3: Penalty for Incorrect Ejection - 41.8% YES. > Would have deducted one point for each incorrect crew ejection. Prop 4-8: Ball/Strike Accuracy - 49.1% YES [32.7% for 98+ anytime, 9.1% for 98+ postseason...]. > Would have awarded one bonus point for each plate performance score above a certain percentage. Prop 4-9: Reason for Ejection Points - 16.1% YES. > Would have based points on reason for ejection + QOC. Prop 6-2-b-5a: Throwing At QOC - 39.3% YES. > Would have applied QOCY/N to Throwing At ejections. Prop 6-2-b-5b: Elimination of Irrecusability - 25.0% YES. > Would have required all ejections to be QOCY/N. Prop 6-3: Scott Rule Pitch Location QOC - 40.4% YES. > Would have deemed dual borderline pitches (with both horizontal & vertical values of borderline) as BALL based on "expected call." Prop 6-4: Appeals Board Composition - 33.3% YES. > Would have expanded the UEFL Appeals Board from nine to 11 members. Prop 8-1: Require Registration - 44.4% YES. > Would have required DISQUS commenting platform registration, disabling guest comments. Prop-A: Permanent Appointment - 38.5% YES. > Would have allowed at-large Appeals Board members to be considered for permanent appointment. Arik G: 78.0% YES [46.3% for 2019 + 31.7% for permanent appointment]. cyclone14: 79.5% YES [46.2% for 2019 + 33.3% for permanent appointment]. jvick2017: 74.4% YES [43.6% for 2019 + 30.8% for permanent appointment]. MarkCanada: 83.7% YES [44.2% for 2019 + 39.5% for permanent appointment]. MLBUmpireObserver: 92.8% YES [47.6% for 2019 + 45.2% for permanent appointment].